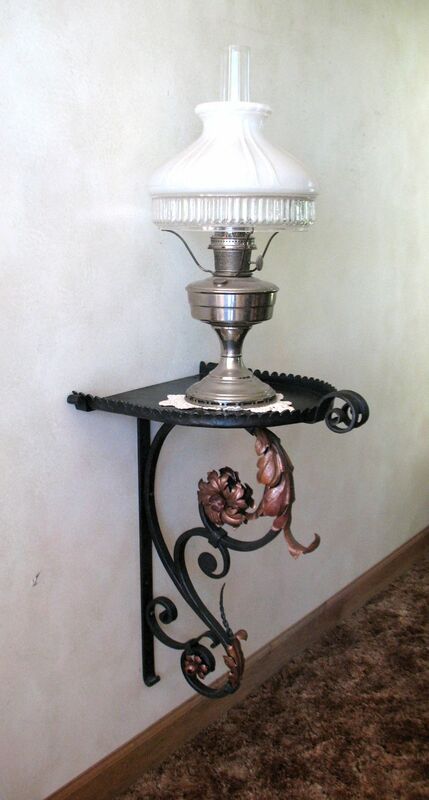 This Paschal Candlestick was made for St. peter’s Church, Forestville, WI 16″ x 50″, mild steel, wax finish. It is also a processional piece, as the top is removable, separating at the collar underneath the twist. I recently completed this maquette, designed for a client whose home overlooks Lake Michigan from atop the bluffs. My goal was to capture the essence of the Autumn gales (swirling winds and water), dubbed “the witch of November” by the mariners of the Great Lakes region. I had already made several drawings for the client of several different designs. However, I wasn’t 100% excited about any of them, and consequently, I told them I was going back to the drawing board. This design actually hit me in the wee hours of the night while lying in bed. As not to forget the idea, I rose, and went down to the office to make notes. The curious thing about this piece was that I typically make a scale drawing for my projects. But I had the idea so solidly embedded in my head, with much anticipation, I embarked on the project the very next morning without a drawing. I did make scale drawings on the layout table of some of the patterns, and did the math so each bar’s termination would end up in a specific spot. However, I did want to take the project at a slow but sure pace, leaving a bit of spontaneous inspiration to come from the process itself…and I wasn’t disappointed. 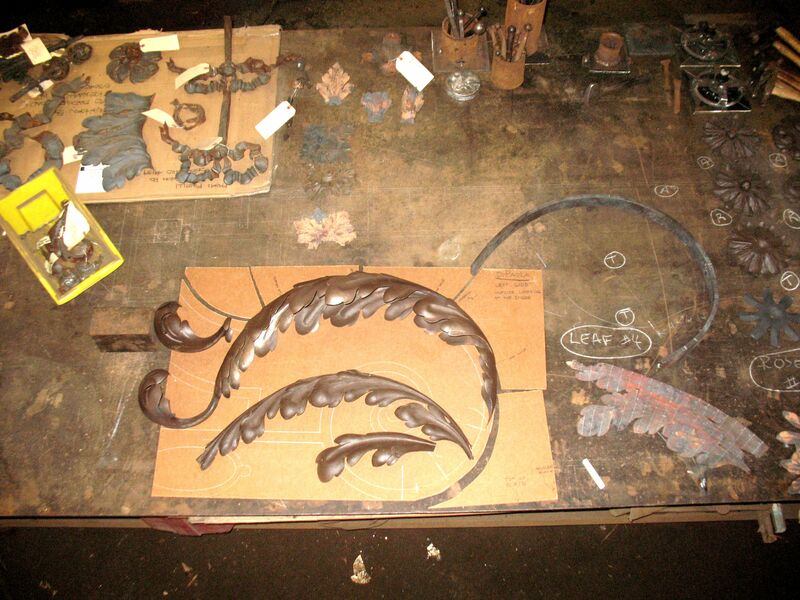 The final forged piece, (the swirling ribbon as a centerpiece), took some thought. I tried various motifs, some very different to add contrast, and some going outside the box by starting inside and wrapping around the perimeter. None seemed quite right, especially the latter which made the piece top-heavy. Pondering again the winds and water, I was pushed to further reflect on the turbulence, yet the interaction of these elements that produce storms out on this great lake. 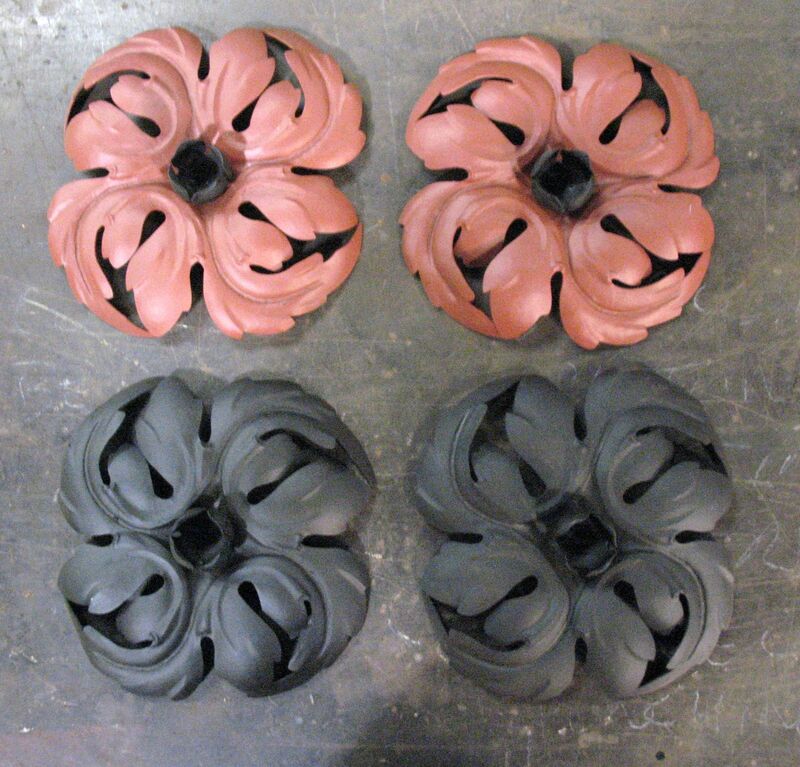 Then the idea of a volute form struck me, but with some contrast to the rest of the piece. So I envisioned a ribbon, with texture to offset the otherwise smooth and flowing plate. This seemed perfect, as it subtly represents the epicenter of a storm. This piece is 1/2 scale of the proposed finished sculpture. It is 16″ x 44″, so the final piece will stand about 88″ high. 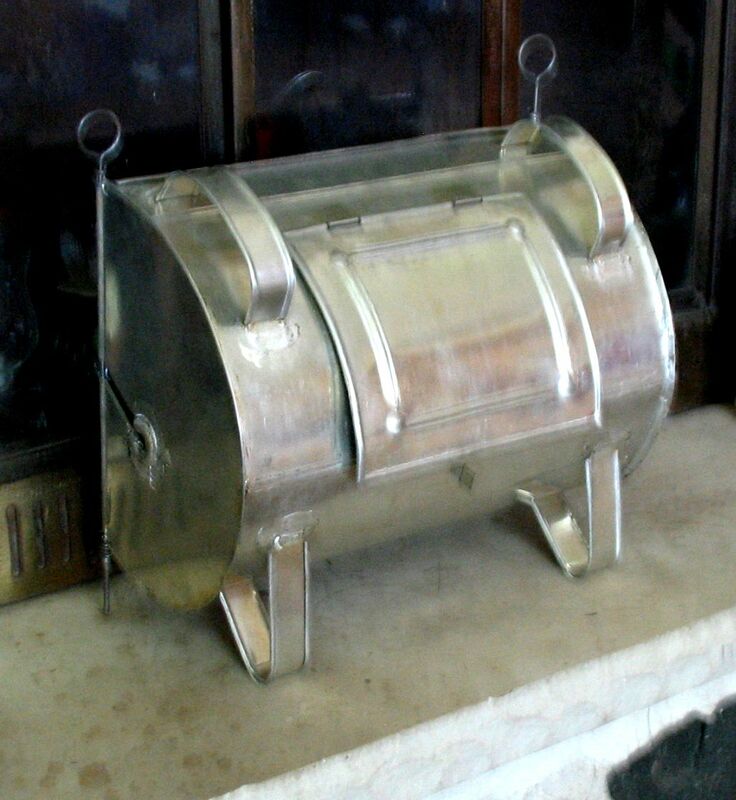 The model is mainly of 1/2″ round mild steel, 1/8″ plate, with the centerpiece (see detail above) made of 3/4″ round. Black and silver Gilders Paste finish. I also wanted the audience to have a intriguing view from any vantage point. The intersecting lines, plus the positive space of the plate flowing around the piece gives the feeling of movement from all angles. 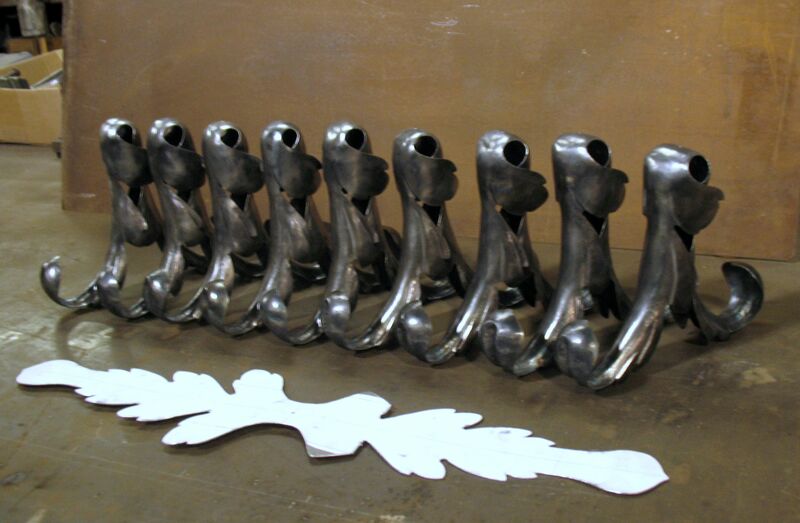 The full scale sculpture will incorporate 1″ bars, which will be a challenge, however very dynamic in the end. That said, I am also giving the client the option of a 3/4 version at 66″ high, made with 3/4″ bars. Here are two professionally shot images of the Processional Cross that was made for St. Peter’s Lutheran Church in Forestville, WI. Images taken by George Lottermoser, of Lottermoser and Associates, Germantown, WI. 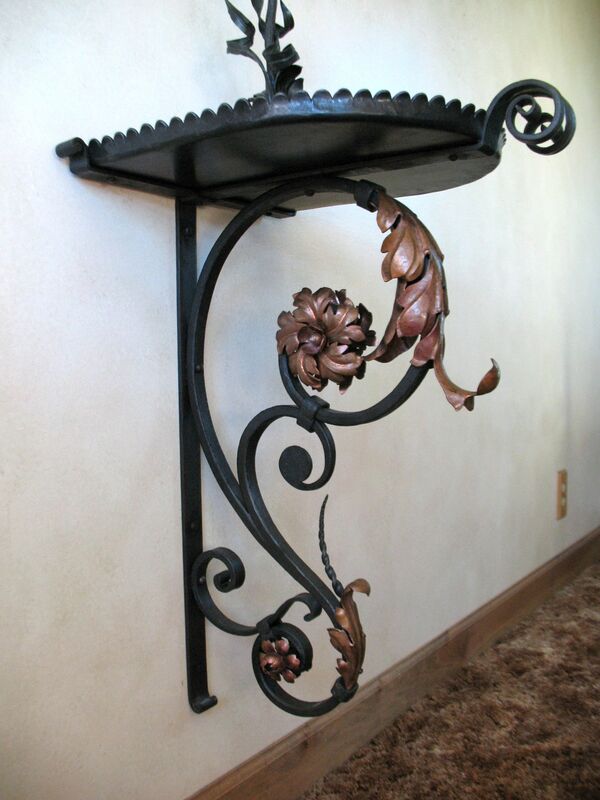 This piece is mild steel, hand-forged, and has a Gilders Paste (TM) finish. 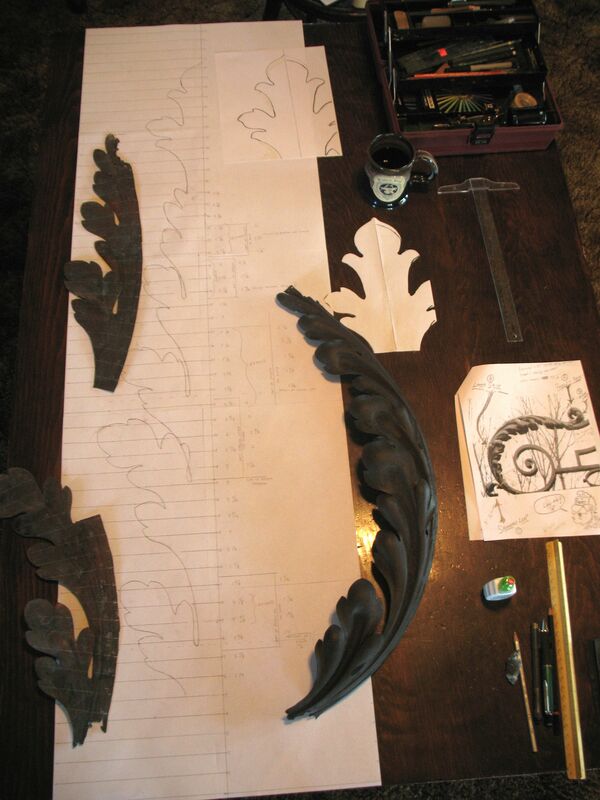 The fleur-de-lis pieces are of French repousse’, made from 18 gauge mild steel sheet. Designed and executed by Dan Nauman. Processional Cross. 17″ x 24″ x 96″. Mild steel, Gilder’s Paste finish. Main bars are 5/16″ square, and there are roughly 40 forge-welds in this project. 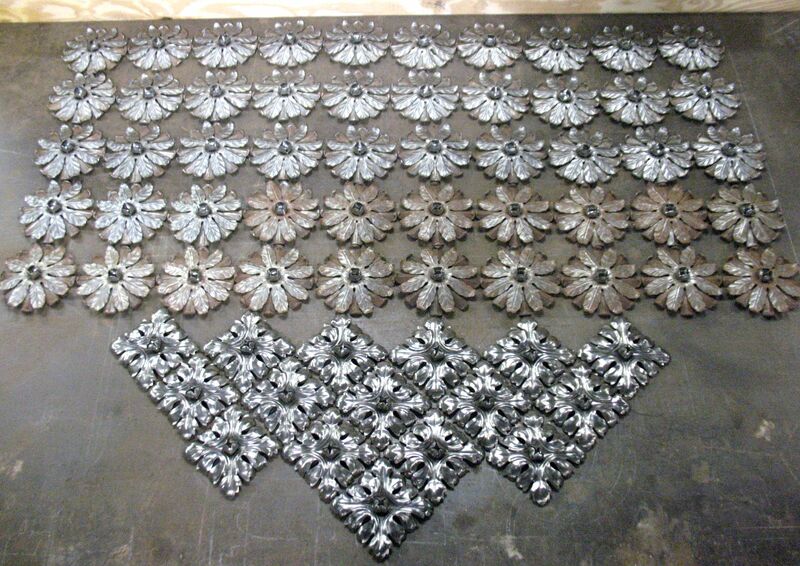 The French repousse” process was used to make the fleur-de-lis, rosettes, and button husks. The 43″ tubular staff lifts off the base for processions. made for St. peter’s Lutheran Church, Forestville, WI. Professional images will be taken and posted here in the near future. This is the Birch Point Chandelier. Designed and executed by Dan Nauman. It was installed May 26, 2016 near Hayward in northern Wisconsin. I was assisted in the installation by my assistant, Jeremiah Backhaus, who also helped me with some aspects of making this piece. One of the owners, as well as his friend who did the timber frame work on this lodge (hand hewing and all), also helped with the install. The piece is approx. 72″ x 84″, with a 10-1/2′ drop. It is made of mild steel, copper, slumped glass, and elk antler sheds. 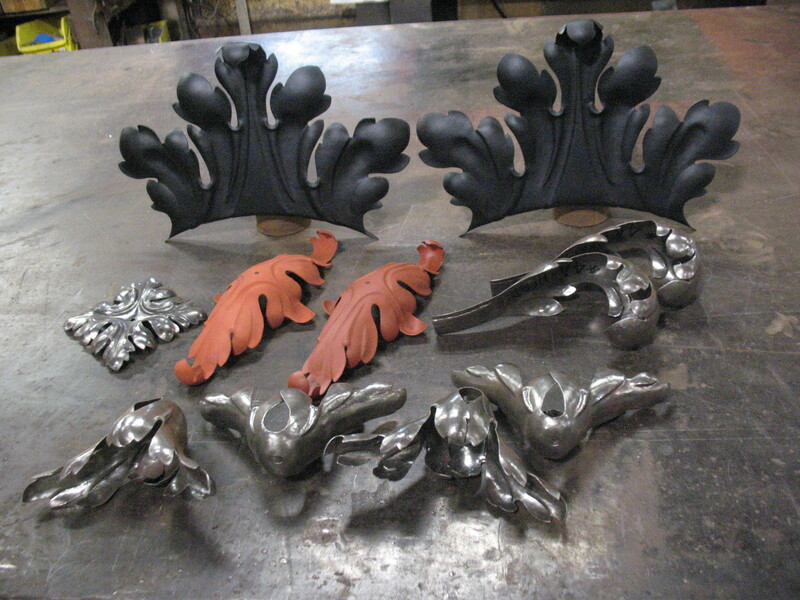 I made almost every piece on this chandelier, through hand forging, and French repousse’. The exceptions were three collars that were bored out by a friend, as I did not have a large enough drill bit for my lathe, nor a boring bar. I also had the patterns for the birch leaves laser cut by Muthig Industries in Fond du Lac, WI. 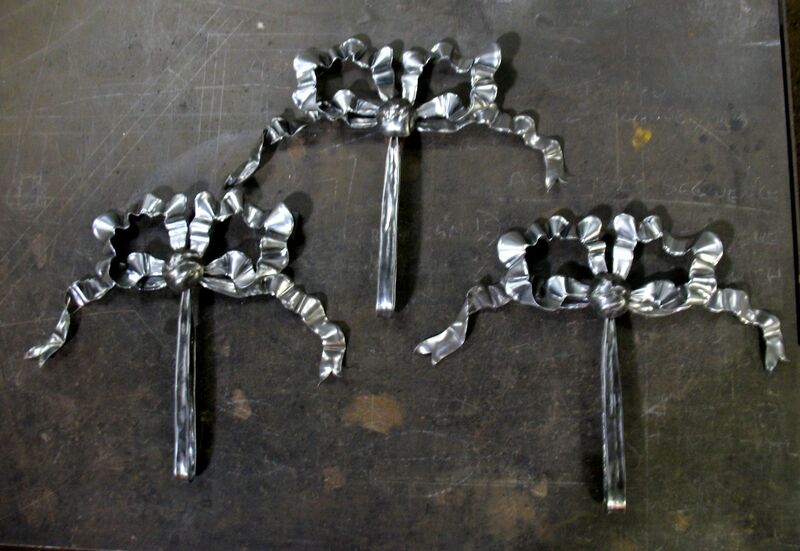 The stems were cut purposely wide, so I could forge them down to round. I then hand-veined, then hot-sunk the leaves into a tree stump to give them volume and movement. The piece was sand-blasted, and has a poly-chrome paste finish. John Abler, of Abler Art Glass in Kiel, WI (john@ablerartglass.com) made the two glass shades which are 10″ and 14″ in diameter. The glass was slumped in sections, and leaded together to from a hemisphere. The elk antler sheds came from Idaho, specifically: Yellowstone Antlers, Donovan Shipton (don@yellowstoneantlers.com). Don did a fine job of finding three matched sets, that were relatively close in size from one set to the other. The piece was wired by Zach Skarda at Heritage Lighting, Cedarburg, WI (zach@antiquelights.com). The piece was sandblasted. I then applied black Gilders Paste (TM). Once dried, I polished the entire piece. A second application of paste was applied to give the piece bronze highlights. The image below better illustrates those highlights. Once the piece was installed, the owners delighted us by giving us a tour of this fine lodge, designed to give the feeling of a 1940’s vintage east coast hunters lodge, complete with full bear mount, elk shoulder mount, a mammoth wood fireplace in the great room, and of course, a timber-frame log construction…of which was hand-hewed locally by artisans. Further, they prepared a fine meal centered around a side of bison, prepared to your liking, asparagus, wild rice, fine red wine, ice wine after supper, and also strawberry rhubarb pie and strawberry shortcake…all home-made, and all served beneath the warm glow of the newly installed elk-antler chandelier. The evening was capped off by stories and yarns. I awoke early the next morning (5:45), made coffee, and from the porch overlooking the lake, I watched the sun’s rise. Serenaded by loons, and entertained by two otters, the morning started off perfectly. Our hosts then prepared a fine breakfast, and again we dined under the light of the chandelier. A delightful climax for a journey that began last December. This elk-antler chandelier is being made for a “cabin” in northern Wisconsin. When completed, it will have 15 lamps, and two stained-glass shades, one mounted at the top, and one at the bottom. 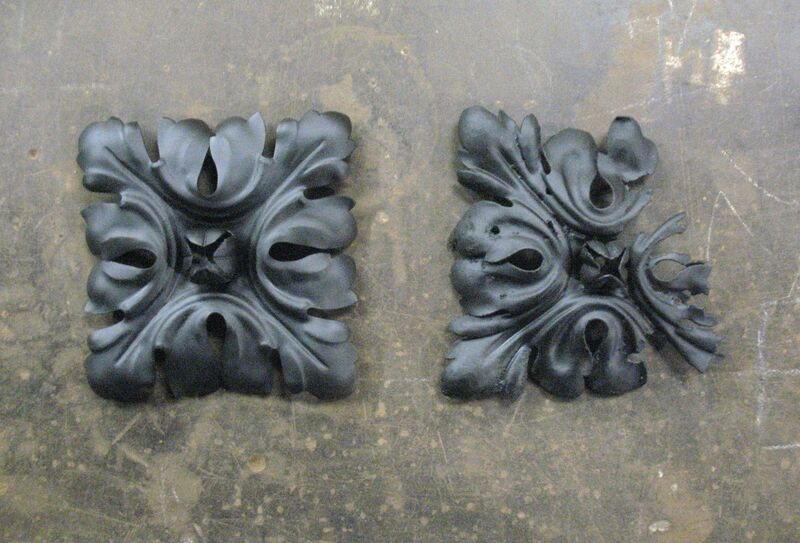 There will be added metalwork to mount the shades as well. Stay tuned to see the finished product. 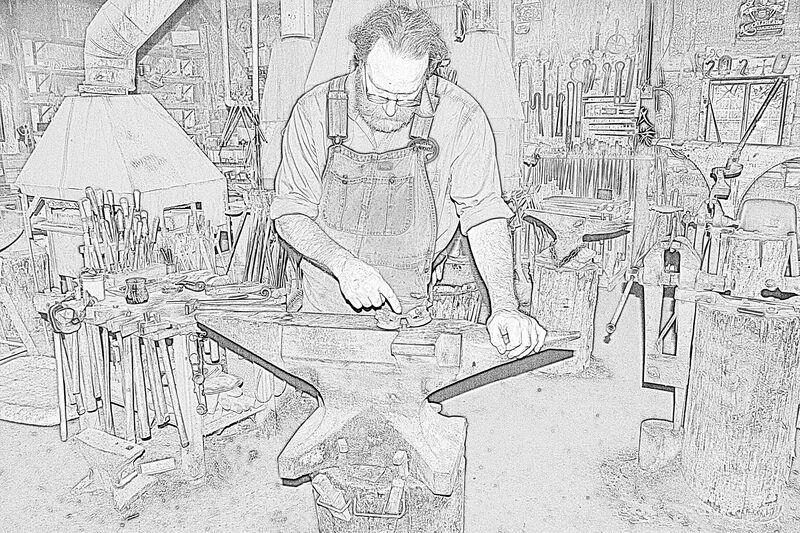 Last week I was interviewed by Victoria Patti of “BlacksmitHER Radio”, a podcast site where Victoria has candid interviews with metalworkers, artists and artisans alike. 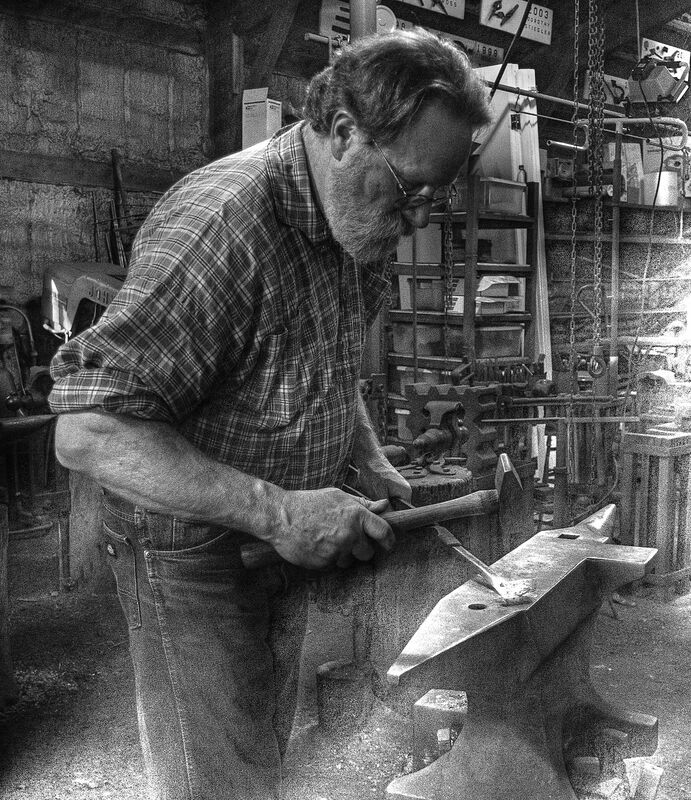 The address is http://www.blacksmither.com In this interview, Ms. Patti essentially announces to the listeners one of my new endeavors: I am the new editor for the “Hammer’s Blow“, a publication provided by “Artist Blacksmith Association of North America” (ABANA). If you are so inclined to listen to my interview, it is episode #48. Thanks so much, Victoria. This piece, 16 x 18 x 25-1/2 in, was inspired by the large acanthus leaf on the upper portion of the “S” scroll. I had been wanting to make that leaf for several years. So I finally made it last month, while visiting my friend Tom Latane’, a fine fellow and blacksmith in Pepin, WI. Tom and I had been working on twin projects, two tin kitchens, on and off for the last couple years together. 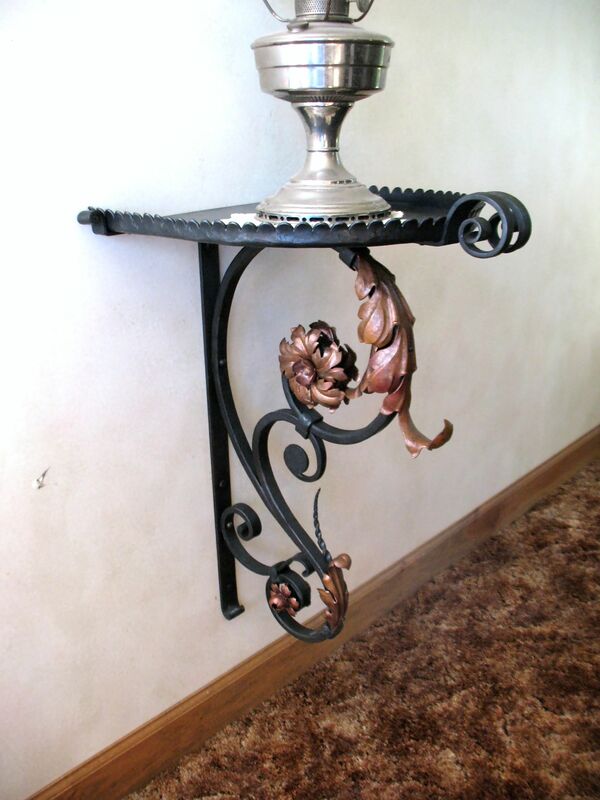 One aspect of this project that I enjoyed was using copper for the repousse’ elements. I typically use 18 gauge steel, but in this case I used 16 gauge copper. It forms very easy compared to steel, as one might expect. However, it also shows every hammer blow…on target or not. That said, the errant blows are more easily erased in copper than those in steel. By the way, if you ever wish to have a truly fine dining experience, I highly recommend “Smyth”, the restaurant located inside the “Iron Horse Hotel”. I have dined there on several occasions, and every time the cuisine has been exceptional. We ordered two hors-d’oeuvres; one was spiced goat cheese, and the other was seasoned scallops on a bed of fresh corn. The hotel and restaurant are a stone’s throw from Milwaukee’s “Harley Davidson Museum”. “Nobody goes there anymore…it’s too crowed”. – Yogi Berra, when asked about a local restaurant. 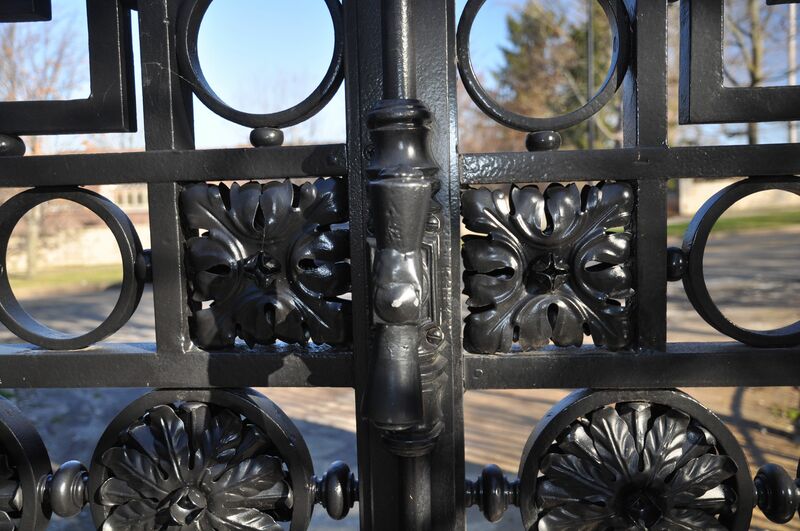 Edgar Brandt Gate, restored in 2014 by Dan Nauman, and Finelli Ironworks. 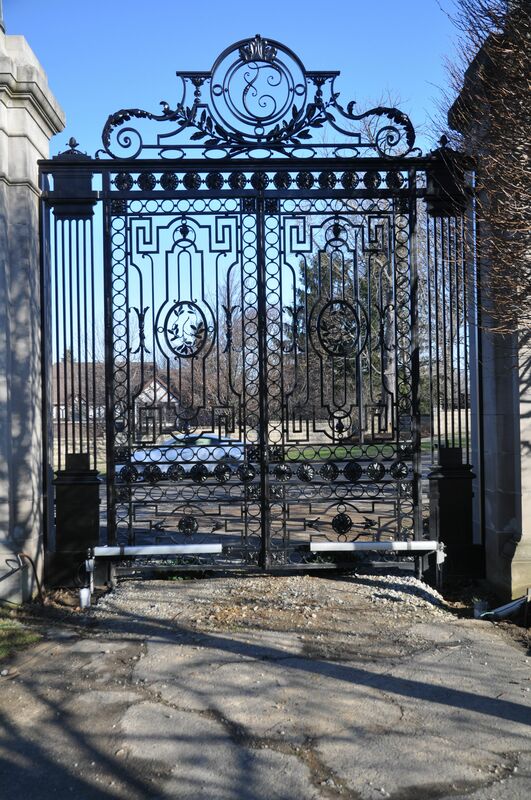 Jim Korosec of “Finelli Ironworks”, contacted me a few years ago to help his company restore two sets of identical gates in Cleveland, Ohio. That was the beginning of a long, interesting, and sometimes trying journey. 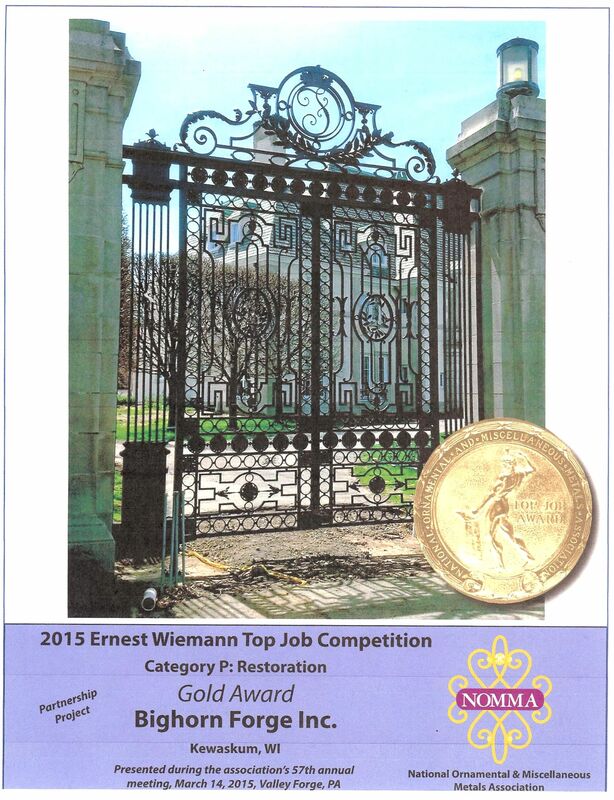 I am pleased to announce that through a combined effort with “Finnelli Ironworks” of Solon, Ohio, a gold medal was awarded for both our efforts last month by the “National Ornamental and Miscellaneous Metals Assoc.” (NOMMA), at their annual “Top Job” competition. 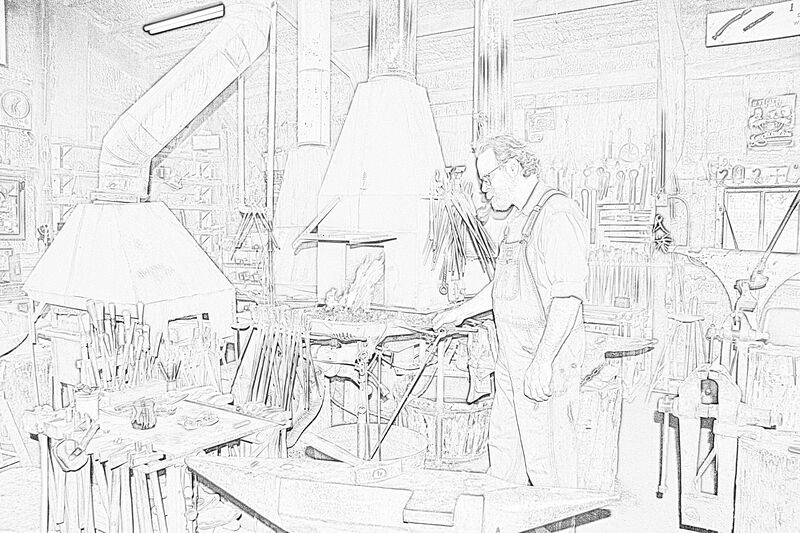 As only one company can enter for a given project, only “Finelli Ironworks” was recognized, however “Bighorn Forge. Inc.” will receive a duplicate gold medal along with a certificate. 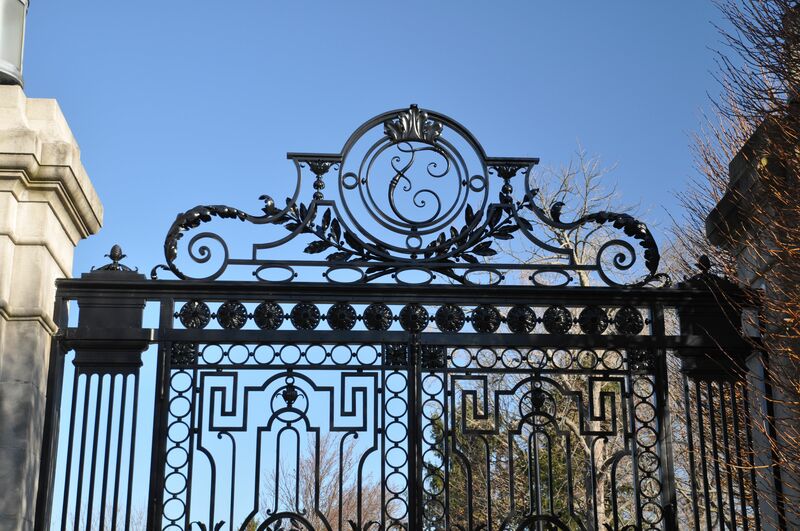 We reproduced all of the rosettes, husks, and acanthus leaves for these gates, primarily using the French repousse’ method of metal forming. The original pieces were machine stamped. This effort took well over 1100 hours, and resulted in two carpal tunnel surgeries for me. To give you an idea as to how much time is invested in each piece, each compound square rosette above has about 5-1/2 hours invested x 64 sets. That equates to 352 hours, just for this series of pieces. In order to reproduce these many forms, there was extensive research into the original pattern development, which was difficult as many original pieces were so rusted away, that only fragments remained, as the images below demonstrates. The image above of the very large acanthus leaf pattern shows some of the remnants used to approximate the original pattern. Note that the original “parrot’s beak” at the end (scroll-like termination) is missing entirely. Five pattern changes on the parrot’s beak, along with three test pieces, were made before settling on one that proved to work well. Below are some images of some of the many reproductions. Husks- 16 total pcs. Note pattern in the foreground. Compound rosettes, eight total sets. Original machine stamped piece on right, hand formed reproduction on left. 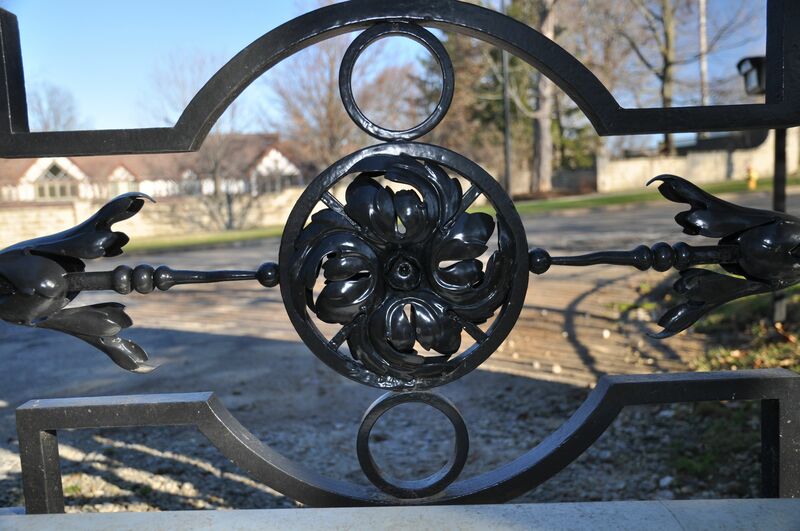 I would like to thank Finelli Ironworks, and specifically Jim Korosec, for getting me involved in this project. By the way, Jim found me via this blog site. 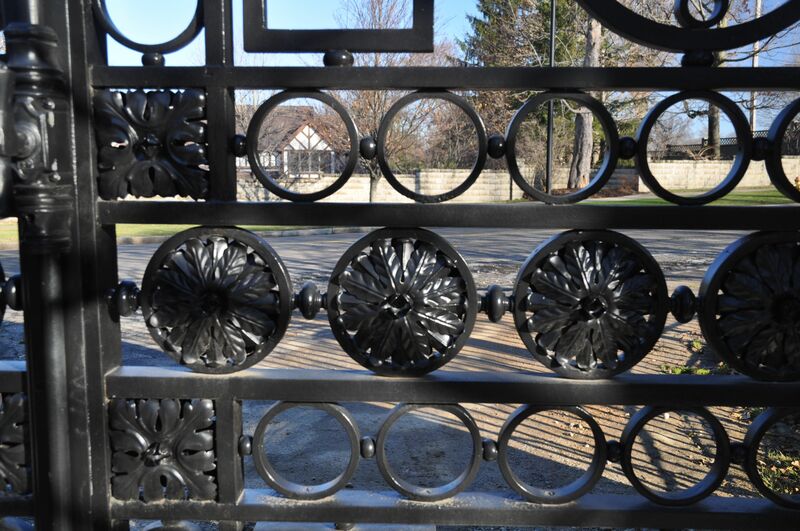 The owner of the gates was ready to fly to France to find someone who could reproduce these pieces by hand. However, just prior to him leaving, Jim found me through this blog-site, and e-mailed me about this project. 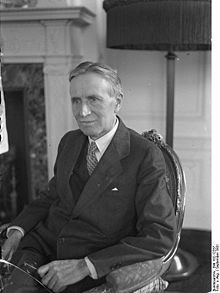 I responded, not expecting a reply from Jim, as I receive many such inquiries regarding parts made by French repousse’. Typically, when folks realize the time it takes…consequently the monetary investment…they back off in a hurry. However, Jim ended up calling me, and said the owner was going to fly to my shop the next day to meet with me. Since I was driving out to Maine to teach repousse’ in just two weeks, I said that I would stop by (in Cleveland, Ohio) on my way back, so there was no need for the owner to fly to my studio. And so, I met with Jim and the owner in Cleveland in August of 2012. Obviously, they trusted that I could do the job. 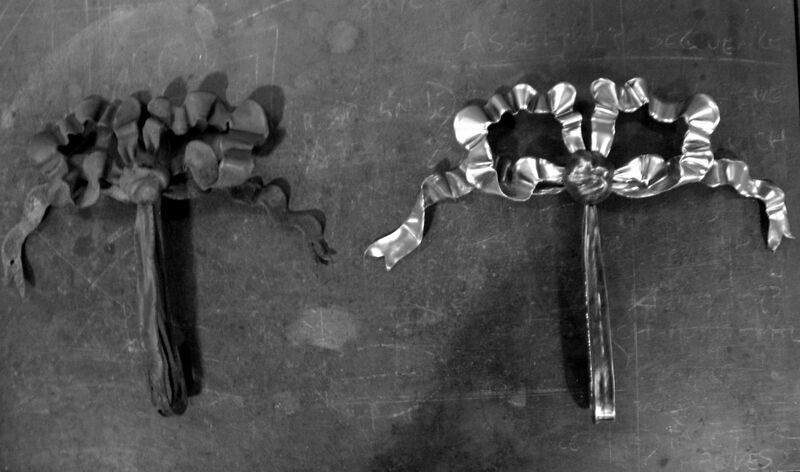 Below are the very last parts I made for this project, which are ribbon bows made of 20 gauge sheet metal. There is roughly seven hours in each bow, of which there are four small and two large versions. These proved to be some of the more challenging of the forms. However it is challenges such as this that keep me returning to the studio. Three of the four small ribbon bows, approx. 20″ x 20″. Original bow to the left, repro on right. There is always a bittersweet end to such a journey. I’ll admit, there were many times I was bouncing off the walls because of some of the repetitious aspects of this project. For example, when I was working on the square rosettes, of which there were 64, (and it takes about 5-1/2 hours per rosette)…when I got to rosette number 15, I was already seemingly headed for the loonie bin, wondering if I’d keep my sanity with so many like parts with so much detail. The carpal tunnel symptoms didn’t help, either. However, what kept me going was that I mentally prepared myself beforehand, knowing that I’d hit the proverbial wall at some point, and so I expected this monotony to happen…several times. 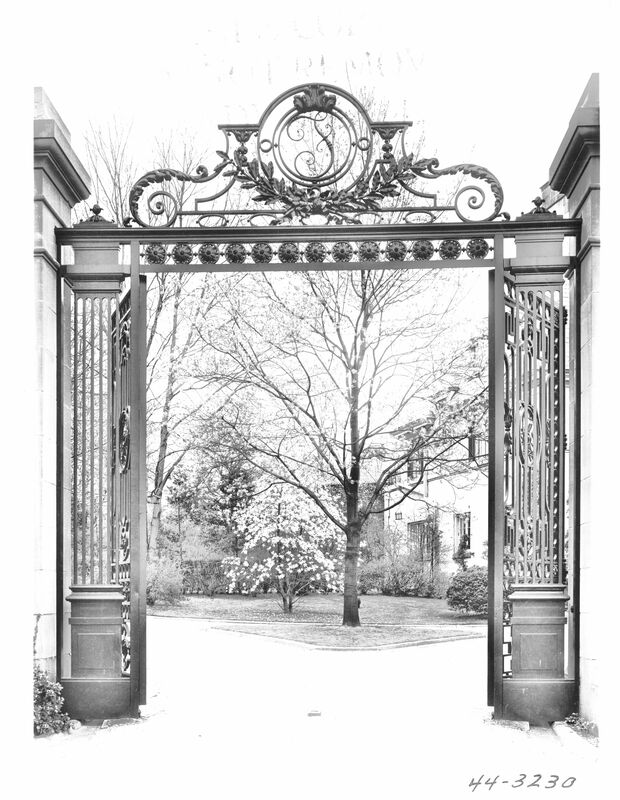 I also kept thinking that when the project was completed, I could stand in front of those gates, and have a fine feeling of accomplishment. And so it has ended, with that very satisfaction as my main reward. I also learned a great deal during this process. Lastly, I wish to thank the Lord my God for giving me the where-with-all to accomplish the task.